Grass needs water, food and protection to grow. Those are found in the environment. Applying a fertilizer containing nitrogen, phosphorus and potassium will help the grass become even more lush. Nitrogen is the most important element because it promotes the growth of vegetation. Nitrogen will make the grass dense, sturdy and thick. It also gives grass it's bright green colors. Phosphorus will strengthen the root system. Potassium works in harmony with the other two elements. It helps the grass fight off disease, drought and cold weather. It also toughens the foliage and roots. Fertilize lawns in the fall or late fall to make grass green fast. Doing so this time of year cuts down on disease and weed issues. Apply fast-release granular fertilizer. It comes in a dry bagged form. Many fertilizers are available in slow release formulas that work over a period of six months. The fast-release compound can make grass green fast. Sprinkle the granulars over the grass. Follow the manufacturer's instructions for application specifics. 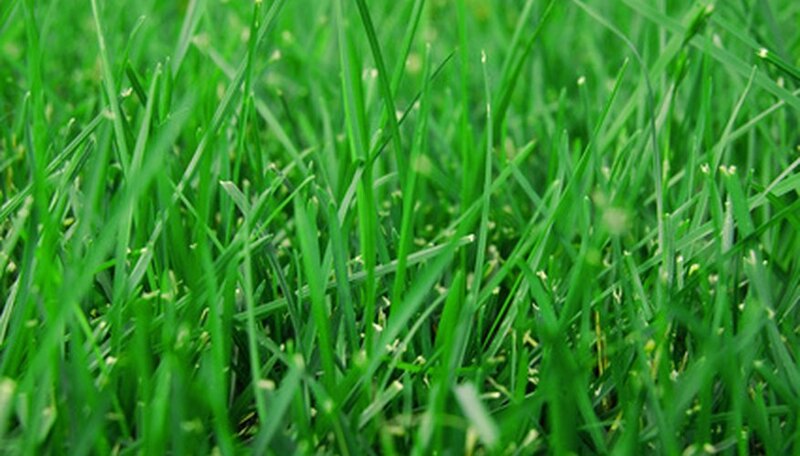 Water the grass thoroughly to prevent grass burn, which is common with fast-release fertilizer. Consider a liquid fertilizer for fast results. Attach the nozzle and hose to the spray bottle of food. The fertilizer mixes with water as the hose is used. The nutrients immediately make the grass green. Re-apply often, following label instructions, for desired results. Give lawns 1 inch of water every week during hot summer periods. Without supplemental watering, the grass will turn brown and go dormant. Set the sprinkler on the same area for at least one to two hours to get 1 inch of water into the soil.